At least nine, see article. Broadly defined, toad is the common term applied to largely terrestrial members of the amphibian order Anura, whose frog-like body generally is characterized by short legs, a stocky body, and a drier, rougher skin than frogs. This division of anurans into toads and frogs is a popular, not a scientific distinction; it does not represent a formal taxonomic rank. More narrowly defined, the "true toads" are those anurans that belong to the taxonomic family Bufonidae. Toads provide important values for ecosystems and for human beings. Ecologically, they are important in food chains, being significant predators of insects and other invertebrates, and serving as a food source for fish, birds, mammals, reptiles, and other amphibians. Toads play a role in nutrient cycles, recycling nutrients from aquatic systems to terrestrial when the toads enter the land after metamorphosis. Toads also serve as indicators of environmental health. For humans, toads have added to the wonder of nature and also have played a historical role in human culture and religion. Indeed, in some cultures, the toad was considered a divinity, and the source and end of all life. In recent years, however, there have been dramatic declines in amphibian populations, including toads, with many of the declines believed tied to anthropogenic factors, such as habitat destruction and pollution. Both practical and ethical responsibilities require proper concern for the health of toad populations. Frogs and toads belong to the order Anura ("without a tail") or Salientia. About five thousand species of anurans have been identified, and these are classified into about 30 families. Frogs and toads differ from the other amphibian orders by the presence of larger hind limbs among the four limbs. Extant adult anurans lack tails. Frogs and toads are the most numerous and diverse amphibians, being found in nearly all habitats, including aboral, aquatic, and terrestrial niches, and every continent except Antarctica. Three species have ranges that extend above the Arctic Circle. Anurans have well developed voices, whereas the other two orders of amphibians are limited to sounds such as coughs and grunts. The terms frog and toad are imprecise, with "toad" commonly being used for any species that is adapted to a dry environment. The use of the common names "frog" and "toad" has no taxonomic justification. 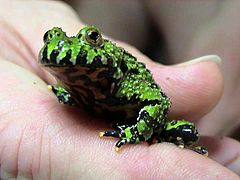 From a taxonomic perspective, all members of the order Anura are frogs, but only members of the family Bufonidae are considered "true toads." The use of the term "frog" in common names usually refers to species that are aquatic or semi-aquatic with smooth and/or moist skins, and the term "toad" generally refers to species that tend to be terrestrial with dry, warty or bumpy skin. An exception is the fire-bellied toad (Bombina bombina): while its skin is slightly warty, it prefers a watery habitat. Toads also tend to have relatively short legs on a stocky body, while frogs are longer legged and slender. 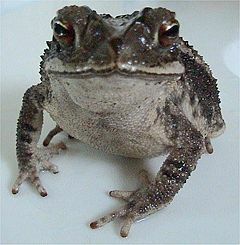 While the only family exclusively given the common name "toad" is Bufonidae, many species from other families are also called "toads," including members of the families Bombinatoridae, Discoglossidae, Pelobatidae, Rhinophrynidae, Scaphiopodidae, and some species from the Microhylidae family. On the other hand, species within the true toad (Bufonidae) genus Atelopus are referred to as "harlequin frogs." 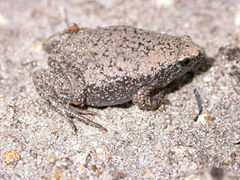 The convergent adaptation of toads to dry environments often is reflected in a brown skin for camouflage, which is also dry and leathery for better water retention. Many so-called toads also burrow, which requires further adaptations. However, these adaptations merely reflect the environment a species has adapted to, and are not reliable indicators of its ancestry. For example, some "true frogs" of the genus Rana, have also adapted to burrowing habits. Since taxonomy reflects only evolutionary relationships, any distinction between frogs and toads is irrelevant to their classification. Both toads and frogs return to water to reproduce and in nearly all fertilization is external (Towle 1989). Tadpoles are the swimming larval forms that hatch from fertilized eggs. Bufonidae is a family of Anura known as toads and are the only family of frogs exclusively known as toads. 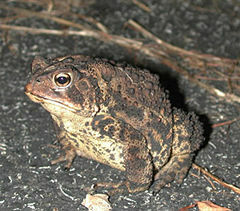 True toads comprise a number of genera, with Bufo being the most widespread and known. Only the genus Atelopus are commonly known as frogs. True toads are widespread and occur natively on every continent except Australia and Antarctica, inhabiting a variety of environments, from arid areas to rainforest. True toads are generally warty in appearance and have a pair of parotoid glands on the back of their heads. These glands contain a poison that the toads excrete when stressed. The poison in the glands contains a number of toxins causing different effects. Some, like the cane toad Bufo marinus, are more toxic than others. One of the toxins of true toads, known as bufotoxin, can cause psychoactive effects. The toxin of some toads, such as the Colorado river toad Bufo alvaris, has been used recreationally for the effects of the bufotoxin, by either their skin secretions or eating boiled toads. The type species of the family Bufonidae is the common toad, Bufo bufo, and around it cluster a large number of species of the same genus and some smaller genera. B. bufo is a tailless amphibian of stout build with a warty skin and any animal that shares these characteristics is liable to be called a toad, regardless of its location in formal taxonomy. Toads are important to the ecology and to humans. In particular, toads are significant predators of insects, as well as other invertebrates. On the other hand, tadpoles are an important food source for fish, and the adult terrestrial toads are a food source for birds, mammals, reptiles, and other amphibians. As such, they play a critical role in food webs. Toads play roles in nutrient cycles and as environmental indicators. Nutrients that have washed from the land into bodies of water via erosion can be recycled by toads as they enter the land after metamorphosis. And as organisms generally highly susceptible to pollutants because of their permeable skin, toads serve as indicators of environmental health. Toads also have played a historical role in human culture and religion. In some cultures, including early Asiatic cultures and pre-Columbian American civilizations, the toad was considered a divinity, and the source and end of all life. In some other cultures, toads and frogs have had less than positive connotations, being correlated with witches and their brews, or as plagues as seen in the biblical book of Exodus. Since the 1970s, dramatic declines in amphibian populations in many parts of the world have been reported, including toads. 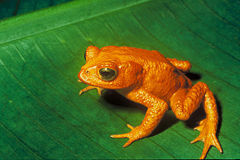 For example, the golden toad (Bufo periglenes) was among the first casualties of amphibian declines. Formerly abundant, it was last seen in 1989. Such amphibian declines are often perceived as one of the more critical threats to global biodiversity. Many of the causes of amphibian declines remain poorly understood. A number of causes are believed to be involved, including habitat destruction and modification; pollution; introduced species (including other amphibians); traffic mortality; over-exploitation and human collections (for food, medicines, bait, pets, and even for teaching biology); acid rain; agricultural chemicals; ultraviolet radiation increases due to decreased stratospheric ozone; and disease. Habitat destruction particularly has been a significant factor. An estimated 50 percent of the world's original wetlands have been lost, and 54 percent of wetlands in the United States. Most the above-mentioned causes have human origins. Clearly, beyond the practical need to preserve toad populations, humans have an ethical and moral responsibility to care for toads, as well as all species. In balance, it should also be noted that only about one percent of amphibian species in general have experienced global declines (Beebee 1995). Beebee, T. J. C. 1995. “Amphibian breeding and climate.” Nature, 374: 219-220. DeGraaff, R. M. 1991. The Book of the Toad: A Natural and Magical History of Toad-Human Relations. Rochester, Vt: Park Street Press. ISBN 0892812613. This page was last modified on 2 April 2008, at 17:51.